In 1996, Bill Gates famously wrote, “We always overestimate the change that will occur in the next two years and underestimate the change that will occur in the next ten.” The changes in the media industry over the past ten years have been truly transformational, but it's easy to lose sight of this fact when immersed in the industry day to day. It's eye-opening to take a look in the rearview mirror and review just how far the business has come in the past decade. Ten years ago, original scripted shows were consumed primarily via traditional television (broadcast, cable, and satellite). This content reappeared in secondary distribution channels such as hotels, planes and packaged media (DVD's) in the home. But many of today’s popular video platforms were in their infancy (or didn't even exist). Hulu launched in 2007, while Netflix, still in its “red envelope” DVD rental phase, added a streaming option for a limited selection of titles. Google bought one-year-old YouTube in 2006. At that time, YouTube was already delivering an average of 100 million video views per day. But most of this content was user-generated or pirated. M&E content providers who uploaded videos to YouTube were simply trying to drive consumers to the primary distribution channels. While Apple launched the first iPhone in 2007, the first commercial phones running Google’s Android did not appear until the following year. And mobile video as a taken-for-granted part of daily life was still years away. As for Amazon Prime? In 2007, it was still just a customer program for receiving free shipping of physical goods. Social media was no different. Even though Facebook launched in 2004, it wasn't available to the masses until 2006—the same year Twitter was born. And Instagram and Snapchat were only twinkles in the eyes of their founders. •	Netflix alone was responsible for 35 percent of all traffic on North American fixed (i.e., non-mobile) networks last year, according to Sandvine’s 2016 Global Internet Phenomena Report. YouTube accounted for 17 percent and Amazon Video for 4 percent. •	The NPD Group’s Q2 2017 Application & Convergence report found that 53 million U.S homes now stream video to their televisions using TV-connected devices (defined as streaming media players, video game consoles, Blu-ray Disc Players, and “smart” TVs connected to the Internet). •	Parks Associates 2017 OTT Video & TV Everywhere: Partners, Alternatives, and Competition report found that 53 percent of U.S. broadband households subscribe to both a pay TV service and at least one OTT video service. •	According to Cisco, mobile today accounts for 7 percent of all global IP data traffic and is projected to grow to 17 percent by 2021. In North America, according to Sandvine, 40 percent of this mobile downstream traffic is video, with YouTube accounting for half of it. •	The NPD Group’s Q2 2017 Smartphone and Tablet Usage report, looking at smartphone usage on both fixed (i.e., Wi-Fi) and mobile networks in the U.S., found that streaming video consumption accounted for 78 percent of data consumption on smartphones. 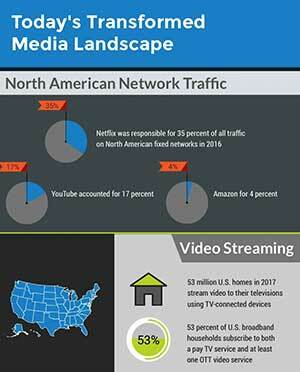 YouTube was identified as the dominant mobile video app, with Netflix a distant second. •	Ericsson’s TV and Media 2017 report found that 70 percent of consumers now watch TV and other video on their smartphones, making up one fifth of their total video viewing in terms of hours per week watched. •	Social media is a big part of this mobile traffic, with Facebook properties (including Instagram) alone now accounting for almost a quarter of all mobile traffic in North America, according to Sandvine.